I use Razer mice almost exclusively on all my computers, but every year or two a problem arises where clicking results in a double click. 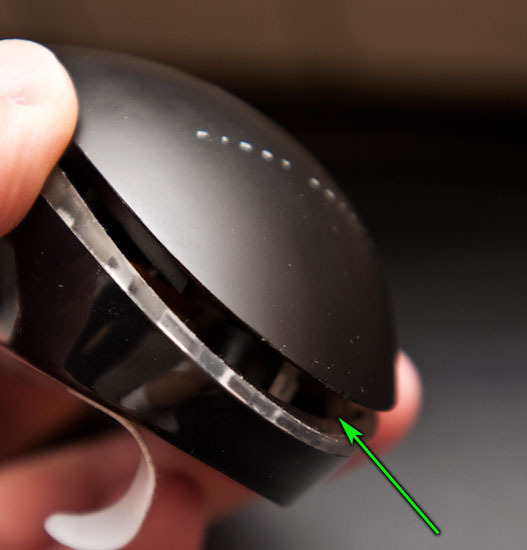 This issue is usually caused by dust or lint collecting near the clicker inside the mouse which changes how quickly the button goes from depressed to open circuit. Because the timing changes, the firmware which controls the debouncing logic gets confused and intermittently (and then later always) registers a double click. This is of course very annoying when trying to highlight text (because the double click cause the text to unhighlight) and other mouse clicking activities. Solving this problem is pretty easy and the procedure is the same for both the Copperhead and Diamondback mice that I have. Flip over the mouse and look at the underside. 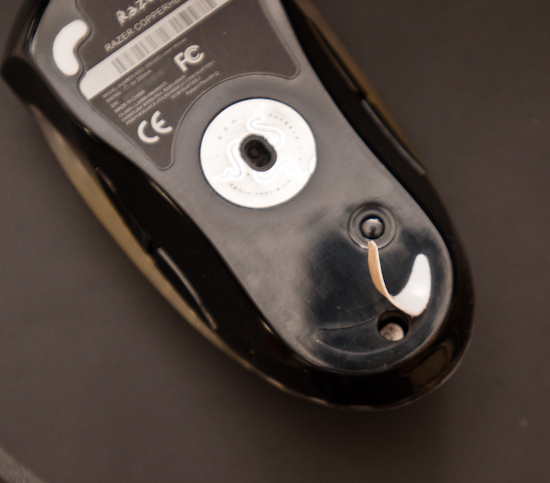 There is a screw underneath the bottom pad by the heel of the mouse. Peel the pad open (or remove it entirely, but keep is from getting dusty since we'll need to reapply it). 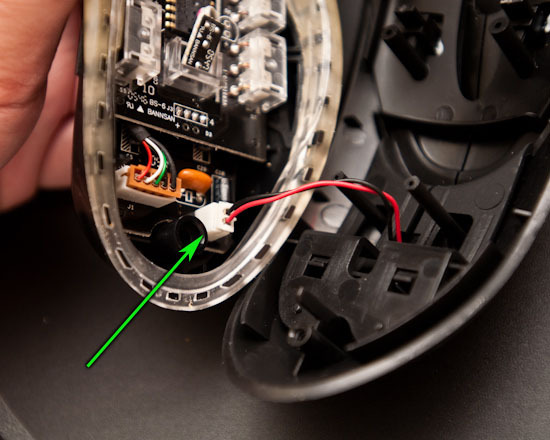 Use a Philips #1 screwdriver to remove the screw holding the hood of the mouse onto the base. 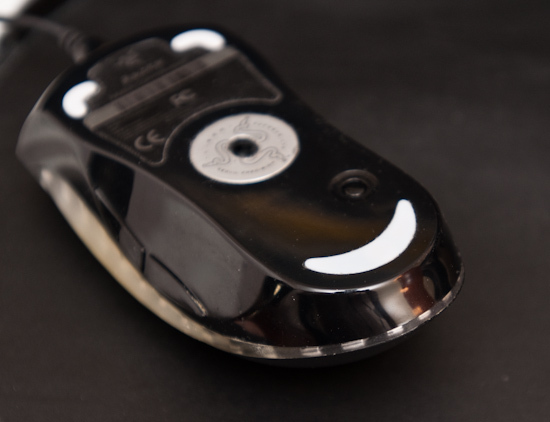 Once the screw has been removed, you should be able to insert your fingernail or a small flat screwdriver into the heel of the mouse and pop the hood up from the base. This next part is a little tricky because it's not obvious. The hood doesn't just lift away. You'll need to slightly lift while pulling the entire hood toward the heel of the mouse to release the hood. There are two tabs that hold it in place that prevents you from lifting straight up. Be careful not to break these. 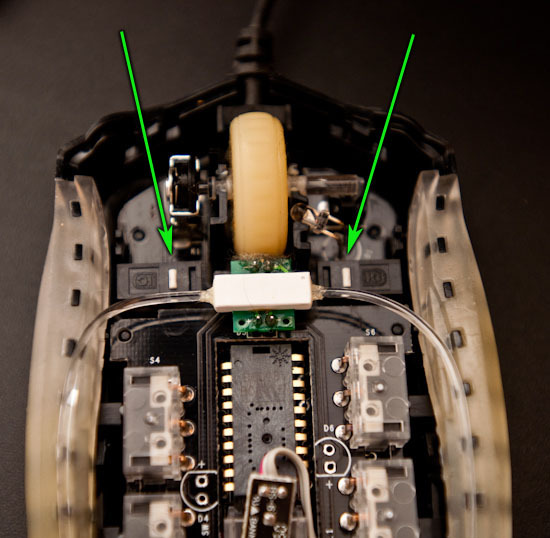 Clean the inside of the mouse if it is dusty using compressed air and/or a lint-free brush. The two contacts that register the mouse clicks should be cleaned with a little bit of rubbing alcohol applied to a Q-tip or small square of paper towel (I usually just tear off a 1-in x 1-in square of paper towel). 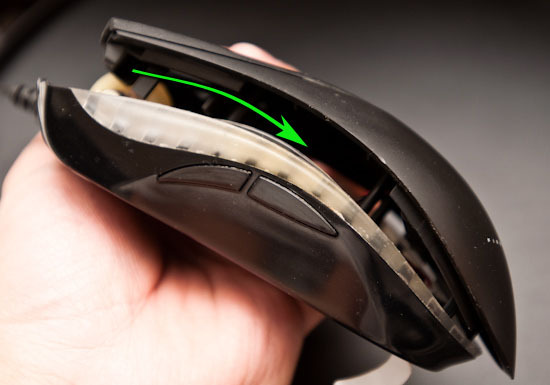 Once clean, reassemble the mouse by sliding the hood back on (make sure it goes on fully before screwing it in), tightening the base screw, and reapplying the pad. This should solve the double click / debounce issue. Thanks. I managed to clean most of my mouse using your guide. How does one exactly clean the contacts? I mean, there's still that black thing surrounding them. I can't get this to work, although I must admit I don't have any rubbing alcohol at the time. Only my right mouse button needs cleaning (or, shows the symptoms). Also, is there an alternative to rubbing alcohol? There is! I tried contact spray after a hint on a forum, worked like a charm. Thanks again! thx my left click was very bad!! 1.000.000 of THANKS from Spain. You have saved me 60€ on a new mouse. Though cleaning them was nto quite enough, but it did elimimate 90% of teh double-clicks. I found another guide that suggested putting a tiny dab of superglue on the underside of the button contact post, but your pics were better. I guess that post that pushes the button down gets worn down, whcih happened in my case. Finally I've disassembled another cheap mouse and get their microswitch and solder in the copperhead. Now works really fine. I don't kwow how is it possible this poor quality components in a 65€ mouse. In my second year of warranty I get a new mouse from Razer for this same problem but now warranty was expired and I fixed the problem. I'LL NEVER BUY a razer device in my life. I'm a few years late to this party but just wanting to thank you, looks like I just saved $50. My (free) dell promotional Razer Diamondback lives on to fight another day. The left clicker didn't look too bad but apparently enough to cause the double click issue. I found more gunk in and around which I've also removed and the mouse feels like brand new again.